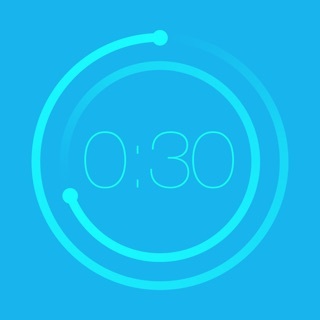 "Bit Timer promises to be the 'World’s Simplest Interval Timer Ever.' It is." - Fast Company Design. 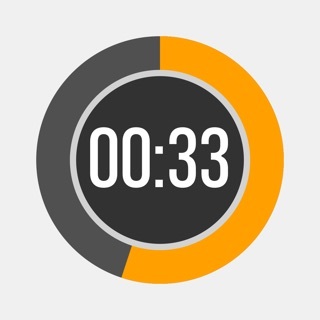 “Some of the best apps are those that do one simple thing well, and Bit Timer for iOS looks like it will provide that for workouts.” - The Verge. “Its clean user interfaces makes organizing interval workout sessions a breeze.” - Gear Patrol. This app is designed for the no-frills, hard-core HIIT workout. This is the first interval timer you’ll see with a set-up that is this fast and easy. Your workout should be intense, not your workout set up. Get to your workout in no time with a clean, simple, no-frills design. Clear, easy-to-distinguish tones for each portion of your workout. Lock your phone, navigate to other apps and stay up-to-date via notifications. 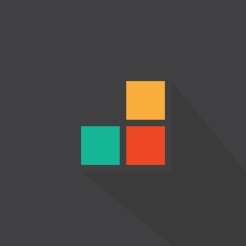 - Press and Drag to quickly set Work, Rest, and Repeat. - 20 Repeats with background processing. Up to 40 if background processing is off. 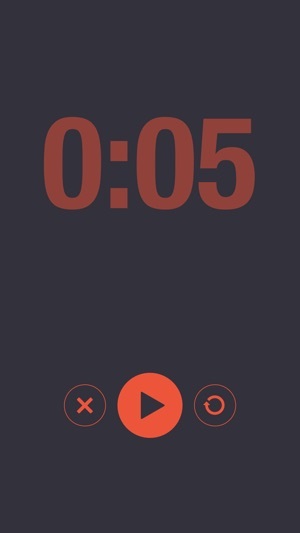 - Integrates with notification center allowing you to lock the phone or navigate to other apps while the timer runs and still be notified when the intervals change. 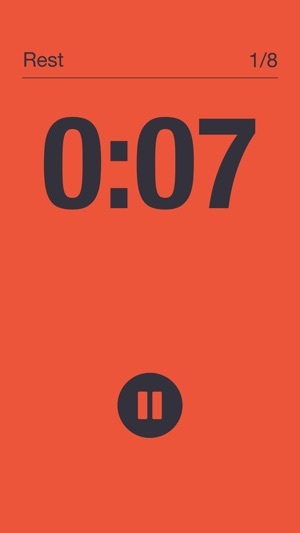 - 10 second countdown allows you to get into place before your workout starts. - Three distinct sounds to designate where you are in your workout. - Countdown tone gives warning before Work starts. - Pause your workout at any time and restart right where you left off. - Reset your workout at at time if you were interrupted and want to start from the beginning. 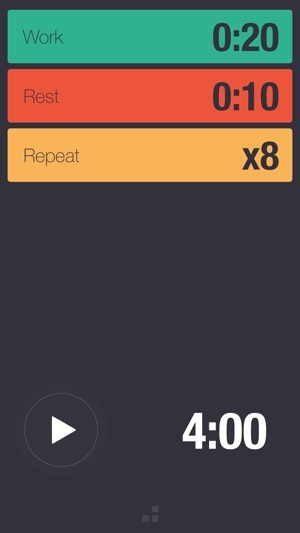 The best tabata/interval timer for iOS. Great design, fast and straightforward. The sounds are simple and polished without being stupid. 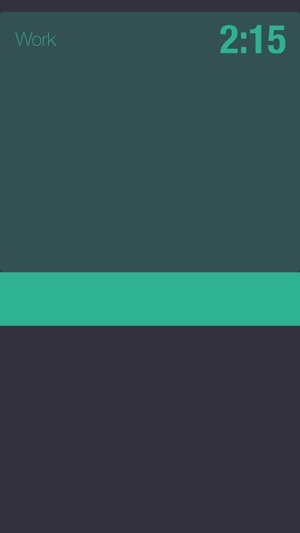 I'd absolutely love it if the designer were able to add a super simple, super clean, totally optional way to save a few routines as presets. I love the clean, simple interface; but I find myself frequently fiddling with the times throughout my workout, which over the course of months, begins to feel a little frustrating. Wish there was some simple, elegant way to add this without compromising the clean interface, because it would add a bunch of functionality. Aside from this common complaint, the app is great. Five stars! Good for what it is. No plans to improve it though. This app is great for what it is, but after spending the money buy it, I have learned that this app isn't going to improve. If you want a pretty user interface and it doesn't bother you that functionality won't be added, get this app. I think this is more so made for a crossfit coach since they are constantly needing to adjust timer and reps as per the students. Bottom line? If you're thinking of using this app for personal workout where you keep track of what you've done in the past, use a different app. If you want a simple and uniquely beautiful interface with limited functionality, get this app. I personally sort of regret spending the money, I'll use it, but only because I've spent the money already and want to get some use out of it.